In June 2013, the Swiftsure Committee announced a Video Contest. 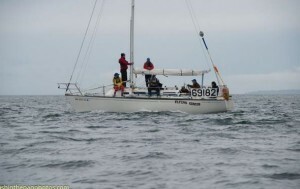 Rules were simple: video to be shot on board while racing in the 2013 Swiftsure and placed on YouTube. The winning yacht must compete in Swiftsure 2014 to receive their prize and be recognized by their peers at the 2014 Skipper’s meeting. Oh yeah – the prize? Beer for each crew member. Throughout the summer, we watched the number of views creep up. Then the contest was promoted again in October, through Facebook, and the hits climbed through the roof. Five videos competed for the grand prize: Wild RuMpUs, Flying Circus, Icon, Avalon and Kairos. All produced wonderful videos but at 11:59 PM on October 31st, one video stood out in front with 554 views. Flying Circus – BIG congrat’s for your winning video of Swiftsure 2013. Kudos to videographer Peter Hallett and skipper Eric Yaremko. See you at Swiftsure 2014 for beers all around! Many thanks also to Dean Vandament of WiLd RuMpUs, Joy Sloan of Icon, Gordon Long of Avalon and Fiona Cubitt of Kairos. Your videos were each really creative.